Do you have that one room in your house that the central heating or furnace can’t seem to reach in the winter? Maybe it’s your basement, or, if you transformed your attic into a bedroom, sometimes the ductwork of an attic doesn’t permit heat, or at least not a properly distributed amount of it. If you’re looking for a solution, or you just want to save a few bucks by keeping your central heat off here and there, then an infrared heater might be the way to go. At Viscount Pools West, we have an electronic infrared heater for sale that is both safe and efficient. Built to warm any 1,000 square foot area of your home or building, the Elite Heat electronic infrared heater is also environmentally safe; it doesn’t let out any fumes into the air like gas heaters tend to do, and it contributes no emissions into the atmosphere. Since infrared heaters use invisible light waves, they don’t burn things to produce heat and therefore will not start a fire in your home. It is made with furniture grade wood, has an extra-long 12 gauge power cord with a flat appliance plug and comes with heavy duty coasters. 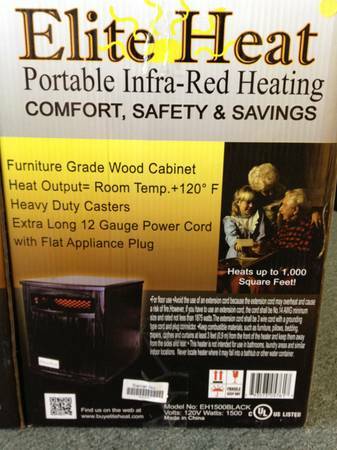 Remember that infrared heaters are also durable, as most have life spans of over 20,000 hours. If you’d like more information, contact Viscount Pools Spas and Billiards in Macomb, MI at (586)-677-7665. Or if you’d rather come on by, we’re located at 51020 Hayes Road at the corner of 23 Mile Rd and Hayes, in the Kroger shopping plaza.